Many of us face the dilemma of whether the email marketing works or not. The fact is, email marketing is the most effective automated tool to convert leads into customer. Profitable sectors like financial services including banking, insurance, mutual fund investment or consultancy services should use email marketing effectively as they offer multiple products and services. If financial institutions invest just a little more of their time on email marketing, they could see their clicks and conversions shoot way up. Nowadays, email marketing is must on financial services website to tap the right bunch of audience. It has become a go-to tool for most of the financial services. Being a part of Digital Marketing, email marketing helps service provider connect with customers digitally. Since it works really well, let’s not lose the customers, and always try to engage, inform and keep their customs intact. Here are some email marketing best practices for financial institutions that will give an insight of why it is a necessity for you! There many financial institutions out there who still refuse the medium of emails. And some also say that they will never send an email. But you have to take into consideration that the world is not flat and everything is not similar. And the truth is that the email performs the best from the rest. Every financial institution must understand the economics of email marketing as it helps in building relationship, loyalty and trust. Email is the cost-effective communication device that reaches to a broad array of audience. It also gives a choice to the audience to have a tailor made alerts according to their interests. There are also few mails that have generic information that the people must know. 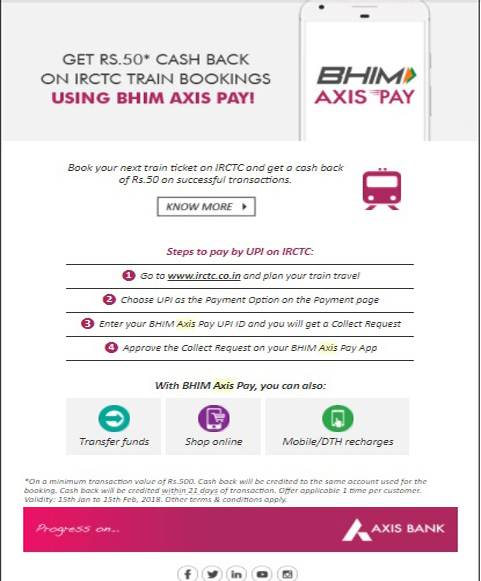 For instance, Axis bank is gives ₹50 cashback on IRCTC train bookings via BHIM Axis Pay. 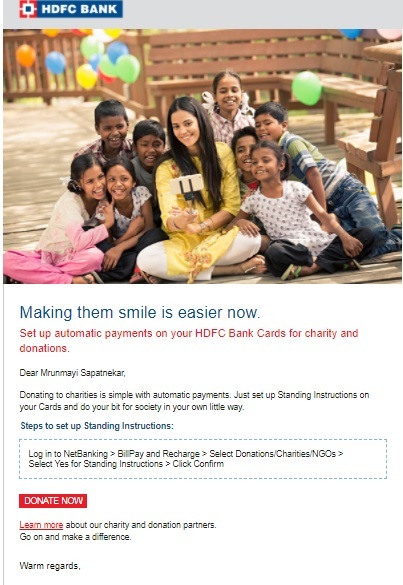 Below is an example of such email by Axis bank. By sending such mails to the customers will not only connect you to a larger chunk and increases credibility. People these days want such schemes and new information. Always keep calls-to-action buttons on such newsletters as it will help you in generating leads. In the above screenshot, the process to pay by UPI on IRCTC is given in just four steps. Anyone who is interested will find it easy and will follow the process. Thus, such kind is really effective while doing email marketing for financial services. Of course, if you are providing what the audience is looking for then, undoubtedly the conversion rate will pace up quickly. Engaging prospects with targeted offers will help you a lot in the long run. 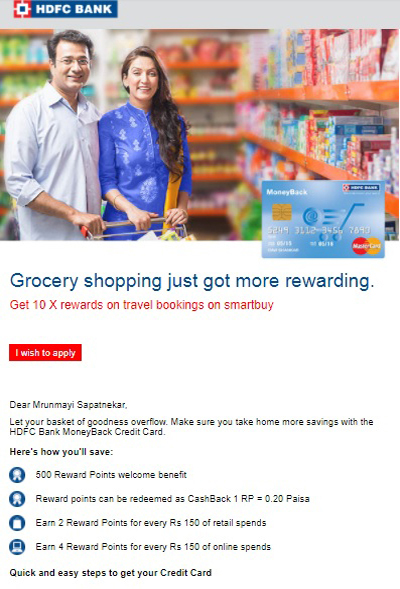 Below is another screen shot of email by HDFC bank in which they are offering a money-back credit card with all its benefits. If the audience is able to take away so many benefits from one offer then they will proceed to the next step. The result, increased conversion rate and also a good amount of customer database. According to research from Return Path, 65 characters seems to be a sweet spot for email subject lines, which is about 15 characters more than the average subject line. When subject lines are 61-70 characters long, they tend to get read. However, most email subject lines are between 41 and 50 characters. If the subject is creative, then be sure of the fact that the reader is going to open the mail. Try to keep subjects short and sweet. For instance, “A Perfect Credit Card For the Traveler In You”, “Earn Upto 50,000 Bonus Reward Points, Get it Now!”, “Check Your Card Eligibility in Seconds”. Such subject lines are meant to lure the audience and they work the best! Segmentation allows to group the customers in interesting ways. Maybe you could create a segment from database based on people who work within structured products and those that work within the pensions sector. You might have a service that might be well received by both, and by segmenting these groups, the copy of the email to these particular audiences can be adapted. Thus, the data can be segmented in many ways like based on geography, product and behavior to name a few. if you are successful with this, the next step also can be to create ‘personas’. Emails are never generic, they always have a personalised touch based on what subject it contains. There are some emails that are a part of Corporate Social Responsibility which every institution has to follow. Thus, in case of such mails, touching the feeling of each individual becomes important. The reader should feel that the email is specially sent to him or her. Instead of always selling your brand, also try to be a little more personal with your customers. They will feel important. The above screen shot represents that an automated payment system can be updated for charity and donations. Such kind of mails will add value to your goodwill. This is one of the email marketing best practices for financial institutions. There are various tools for sending bulk mails to all your database in one click. The tools like MailChimp, Aweber, Benchmark, Campaigner, GetResponse, MailJet, MailUp work the best. One of the most important tasks for a business is to maintain contact with its customers. Developing a newsletter program with a solid audience will prove to be a very important marketing asset for the duration of your company. And these tools are easy to understand and to work on. Email marketing is indeed an effective way towards a successful path for financial institutions. It gives you a deep insight on what you should be doing and thus helps in expanding your database. The vital benefit is also that the privacy of each individual is maintained. The above pointers will help you in planning the next email marketing campaign in full swing. The results that will be measured in your analytics will ultimately determine the type of emails that work well with your customers.